WASHINGTON — The US Senate voted Thursday to extend until 2015 controversial counter-terrorism search and surveillance powers at the heart of the Patriot Act adopted after the September 11, 2001 attacks. Lawmakers adopted the measure 72-23 just hours before it expires at midnight (0400 GMT Friday), sending the bill to the House of Representatives. Voting in the House was not expected until 8:00 pm (0000 GMT), according to a congressional aide. With the clock ticking, President Barack Obama — currently on a European tour — would also have to sign the act for it to pass into law. FBI and intelligence officials have warned that if the Patriot Act is not extended by the deadline they would be robbed of crucial tools in the fight against terrorism — including wiretapping. 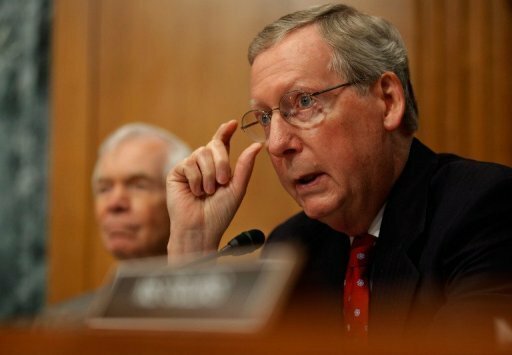 “I have no doubt that the four-year Patriot Act extension, that members of both parties will agree to today, will safeguard us from future attacks,” said Senate Republican leader Mitch McConnell. Congress has debated whether to extend the act just temporarily, longer-term or permanently in recent months. In February, Congress approved a three-month extension to allow time for negotiations. In play are provisions allowing authorities to use roving wiretaps to track an individual on several telephones; track a non-US national suspected of being a “lone-wolf” terrorist not tied to an extremist group; and to seize personal or business records or “any tangible thing” seen as critical to an investigation. While the White House backs extending those powers, the law has drawn fire from an unusual coalition of liberal Democrats and Republicans tied to the arch-conservative “Tea Party” movement who say it goes too far. Republican conservative Rand Paul sought to impede the extension by adding on several amendments, including a ban on inspecting some archives of arms sellers during terror investigations. That measure was rejected in an 85-10 vote. Democratic Senator Patrick Leahy called for greater congressional surveillance in counterterrorism inquiries. FBI director Robert Mueller wrote to Congress leaders on Wednesday to warn them of the urgency of the matter. Madonna is writing to the Queen to ask for assistance with a film that she is making about Wallis Simpson. Known as the Queen of pop, Madonna hopes to receive a helping hand with her new film from a genuine monarch. The 51-year-old American singer is to write to the Queen to ask for assistance with W.E., a film that she is making about the Edward VIII abdication crisis. Madonna, who lived in Sir Cecil Beaton’s former house in Dorset during her seven-year marriage to the British director Guy Ritchie, plans to start shooting the film this summer. The singer has long been fascinated by the 1936 crisis, in which Edward VIII’s desire to marry Wallis Simpson, a twice-divorced American socialite, caused a constitutional dilemma. 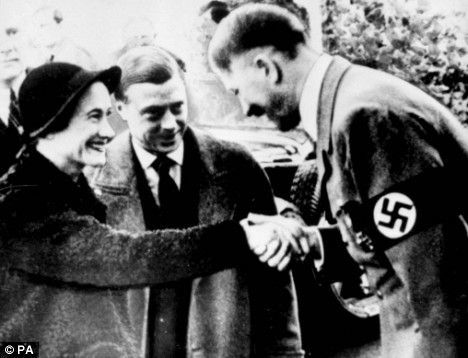 The crisis was resolved by Edward’s abdication and his succession by his brother, George VI, who was the Queen’s father. Edward was given the title the Duke of Windsor and he married Mrs Simpson. The film, for which Madonna worked on the screenplay, will star Abbie Cornish, an Australian actress, as a contemporary woman obsessed by the story of Mrs Simpson. A courtier warns that Madonna should not get her hopes up as filming is generally not allowed in the Royal palaces. “I can’t imagine that Her Majesty would make an exception, particularly for a film about Wallis Simpson,” he says. Who needs tanks on the lawn when you have the Environmental Protection Agency? Barack Obama’s use of the EPA to pressurise the Senate to pass his climate change Nuremberg Decrees shows his dictatorial mentality. He wants to override Congress, which is hostile to his climate gobbledegook because it is representative of the American electorate, and sideline the nation’s elected Senators by ruling by decree, courtesy of the EPA. This is a coup d’état. And what is the justification for this undemocratic action? The allegedly imminent threat from “Anthropogenic Global Warming”. There is always a supposed threat, when tyrants take the stage. The President of the United States has just reduced his moral authority to the level of any Third World dictator heading a “Government of National Emergency”. Fortunately, the world’s leading democracy, which he is trying to subvert, has guarantees of liberty so deeply embedded in its Constitution that US citizens are well placed to fight back. In the first place, regulation can be challenged in a way that laws cannot. So the EPA’s proposed ruling on so-called “Greenhouse Gases” can be opposed extensively with litigation, to the point that the ruling might not yet be in force when Obama demits office. In the second place, the EPA is funded by Congress. So, if the Agency is being used to bypass or neuter Congress, why should legislators not play hardball and retaliate by cutting off its funding? The EPA may look formidable, but its situation is rather as if Rommel were buying the fuel for his tanks from the Allies. But what is of compelling interest on this side of the pond is the way in which the bullets to shoot down American democracy were made in Britain. The trail is not hard to follow. When the EPA published its “Endangerment Finding” on greenhouse gases and proposed rule, back in April, almost every paragraph of the text (Federal Register, April 24, 2009, pp 18886-18910) cited as authority the IPCC’s 2007 Report, which the Agency acknowledges it “relies on most heavily”. And whence came the main input on climate change to that report? Yes, that’s right! You’ve got it: from Phil Jones, Michael Mann and the rest of the lads at the CRU, East Anglia. From the innovative, creative “scientists” who wanted to “beat the crap” out of a climate change sceptic; who “just completed Mike’s Nature trick”; who “can’t account for the lack of warming at the moment and it is a travesty that we can’t”; who deleted e-mails in the interests of science; who tried to prevent publication of dissenters’ views; who coined the historic phrase “hide the decline”. Those jokers are the main authority for the extravagant claims in the IPCC report and, by extension, for the EPA’s “Endangerment Finding”. That is the authority that is being invoked to overturn the principles of 1776 in the United States. The Protocols of the Elders of Norwich are the justification for EPA tyranny. It is with that weighty evidence at his back that Barack Obama is going to Copenhagen to sell out American taxpayers to Third World subsidy junkies, profiteering “green” corporations and the ever entrepreneurial Al Gore. This is the steal of the millennium: forget the Great Train Robbery and the Brinks Mat caper – these hoodlums are targeting $45 trillion. Obama hates America and, increasingly, that sentiment is being reciprocated. This is a socialist, World Government putsch. Have the American people the resolution to resist it? We shall soon know. by Helene Cooper, Michael Wines and David E. Sanger. When President Obama visits China for the first time on Sunday, he will, in many ways, be assuming the role of profligate spender coming to pay his respects to his banker. That stark fact — China is the largest foreign lender to the United States — has changed the core of the relationship between the United States and the only country with a reasonable chance of challenging its status as the world’s sole superpower. The result: unlike his immediate predecessors, who publicly pushed and prodded China to follow the Western model and become more open politically and economically, Mr. Obama will be spending less time exhorting Beijing and more time reassuring it. In a July meeting, Chinese officials asked their American counterparts detailed questions about the health care legislation making its way through Congress. The president’s budget director, Peter R. Orszag, answered most of their questions. But the Chinese were not particularly interested in the public option or universal care for all Americans. “They wanted to know, in painstaking detail, how the health care plan would affect the deficit,” one participant in the conversation recalled. Chinese officials expect that they will help finance whatever Congress and the White House settle on, mostly through buying Treasury debt, and like any banker, they wanted evidence that the United States had a plan to pay them back. It is a long way from the days when President George W. Bush hectored China about currency manipulation, or when President Bill Clinton exhorted the Chinese to improve human rights. Mr. Obama has struck a mollifying note with China. He pointedly singled out the emerging dynamic at play between the United States and China during a wide-ranging speech in Tokyo on Saturday that was meant to outline a new American relationship with Asia. White House officials have been working for months to make sure that Mr. Obama’s three-day visit to Shanghai and Beijing conveys a conciliatory image. For instance, in June, the White House told the Dalai Lama that while Mr. Obama would meet him at some point, he would not do so in October, when the Tibetan spiritual leader visited Washington, because it was too close to Mr. Obama’s visit to China. Greeting the Dalai Lama, whom China condemns as a separatist, weeks before Mr. Obama’s first presidential trip to the country could alienate Beijing, administration officials said. Every president since George H. W. Bush in 1991 has met the Dalai Lama when he visited Washington, usually in private encounters at the White House, although in 2007 George W. Bush became the first president to welcome him publicly, bestowing the Congressional Gold Medal on him at the Capitol. Mr. Obama met the Dalai Lama as a senator. Similarly, while he was campaigning for the presidency, Mr. Obama several times accused China of manipulating its currency, an allegation that the current Treasury secretary, Timothy F. Geithner, repeated during his confirmation hearings. But in April, the Treasury Department retreated from that criticism, issuing a report that said China was not manipulating its currency to increase its exports. While American officials said privately that they remained frustrated that China’s currency policies lowered the cost of Chinese goods and made American products more expensive in foreign markets, they said that they were relieved that China was fighting the global recession with an enormous fiscal stimulus program to spur domestic growth, and added that now was not the time to antagonize Beijing. China is not viewed as a trouble spot for the United States. But this administration, like its predecessor, has had difficulty grappling with a rising power that seems eager to avoid direct clashes with the United States but affects its interests in many areas, including currency policy, nuclear proliferation, climate change and military spending. In that regard, two members of Mr. Obama’s foreign policy team said that the United States’ interactions with the Chinese had been far too narrow in past years, focusing on counterterrorism and North Korea. Too little was done, they said, to address China’s energy and environmental policies, or its expansion of influence in Southeast Asia, South Asia and Africa, where China has invested heavily and used billions of dollars in aid to advance its political influence. The Chinese reaction has been mixed, at best. The official China Daily newspaper ran a column just before Mr. Obama’s arrival suggesting that the United States needed to provide some assurance of its own — to “respect China’s sovereignty and territorial integrity,” code words for entirely backing away from the issues of how China deals with Taiwan and Tibet. In the United States, the phrase “strategic reassurance” has been attacked by conservative commentators, who argue that any reassurance that the United States provides to China would be an acknowledgment of a decline in American power. 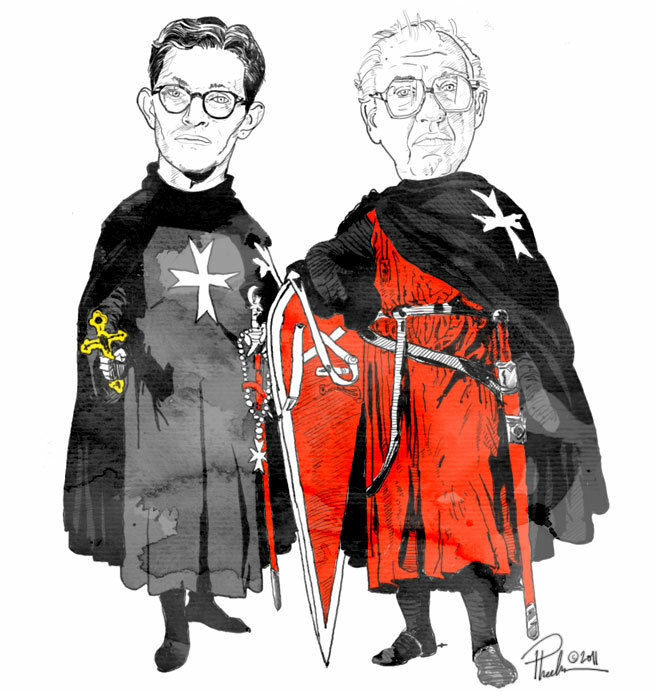 In an op-ed article in The Washington Post, the analysts Robert Kagan and Dan Blumenthal argued that the policy had echoes of Europe “ceding the Western Hemisphere to American hegemony” a century ago. “Lingering behind this concept is an assumption of America’s inevitable decline,” they wrote. White House officials shot back, insisting that it is China that needs to do the reassurance, not the United States. In China, Mr. Obama will meet with local political leaders and will host an American-style town hall meeting with students in Shanghai. He will then spend two days in Beijing meeting with President Hu Jintao. It seems unlikely that Mr. Obama will get the same celebrity-type reception in Beijing that he received in Cairo, Ghana, Paris and London. China seems mostly immune to the Obama fever that swept other parts of the world, and the Chinese are growing more confident that their country has the wherewithal to compete with the United States on the world stage, analysts say. For instance, during the Bush and Clinton years, China might release a few political dissidents on the eve of a visit by the president as a good-will gesture. This time, American officials say, they do not expect any similar gestures, although they say that Mr. Obama will raise human rights issues privately with Mr. Hu. Barack Obama introduced himself as America’s “first Pacific president” as he launched his four-nation tour of the region, vowing to deepen ties with Asia and arguing that China’s rise should be welcomed rather than feared. Kicking off his visit in Tokyo, he also sought to thaw the chill in relations with his hosts, America’s closest allies in the region. The new prime minister, Yukio Hatoyama, has vowed to make Japan less dependent on the US, but the two men agreed to put off the issue of resolving the future of US forces in Japan. However, police in China are reported to have detained dozens of dissidents in a crackdown ahead of Obama’s arrival there today. Human rights campaigners said that at least 30 activists who were expected to apply for the right to hold protests directed at the Chinese government during the US president’s visit were arrested. Reformers worry that Obama will play down China’s poor human rights record in order to maintain good relations on issues such as the economy. “We get the impression Obama doesn’t want to talk about human rights on this trip, but it is precisely because of his visit here that these people are being rounded up and detained right now,” Ai Weiwei, a Beijing-based artist and social commentator, told the Financial Times. American officials have portrayed the trip as an opportunity to develop relationships and make progress on non-proliferation, climate change and the economy, and are playing down expectations of any agreements. As in his previous foreign affairs speeches, Obama emphasised his personal ties in the region – referring to his birth in Hawaii, time in Indonesia and boyhood travels in Asia – and the administration’s break with unilateralism. He held out a hand to North Korea again, calling for it to denuclearise; and to Burma, if it undertakes democratic reform and frees political prisoners, including opposition leader Aung San Suu Kyi. Burma’s prime minister will be present at the president’s meeting with Association of South-east Asian Nations (Asean) leaders in Singapore. Obama also announced that the US will sign up to a trans-Pacific free trade agreement. That may help to deflect accusations of protectionism, which are likely to be aired throughout his tour. He stressed the need for “balanced” growth and said Asian countries should not be dependent on exports to the US. The economic crisis has underlined the interdependence of “Chimerica” in particular and the trade imbalance that has left China with vast US dollar holdings. Washington wants the Chinese currency, the yuan, to appreciate further; Beijing will repeat its concerns that US debt could endanger its dollar holdings. But Obama’s Chinese visit is about more than money. The world’s two largest carbon emitters are meeting just weeks away from the Copenhagen climate-change conference. China’s influence on North Korea and Iran are central to Obama’s non-proliferation agenda. Its handling of Afghanistan and Pakistan will also be high up in discussions. Obama’s China policy is essentially his predecessor’s; the relationship is increasingly amicable. But some fear attempts to broaden it could mean less meaningful engagement. To some observers, the administration is also too keen to please Beijing, wasting leverage rather than smoothing the path to greater gains. Obama’s decision not to meet the Dalai Lama last month – aides say he will do so in future – “doesn’t send a signal that the US wants to work with China; it sends a signal they have basically got us,” said Cha. The Maryland scientist arrested this week on suspicion of attempted espionage had contributed to the Reagan administration’s “Star Wars” missile defense program, the Associated Press reported yesterday (see GSN, Oct. 20). Stewart Nozette, 52, is charged with two counts of trying to communicate, deliver and transmit classified secrets. He was arrested on Monday after he reportedly shared information on U.S. satellite technology with an undercover FBI agent posing as an Israeli intelligence officer. Nozette had knowledge of “some of our most guarded secrets,” so he could have caused significant harm to U.S. national security if successful in transferring the information, Assistant U.S. Attorney Anthony Asuncion said yesterday in federal court. Nozette was ordered jailed without bond. He is next scheduled to appear in court on Oct. 29. If convicted, the suspect could be sentenced to life in prison. Former co-worker Scott Hubbard said Nozette had specialized in defense technology and had been involved in the 1980s Strategic Defense Initiative. “This was leading edge, Department of Defense national security work,” said Hubbard, a former NASA staffer who is now at Standford University. Nozette was based out of the Energy Department’s Lawrence Livermore National Laboratory in California while he worked on the Star Wars program, according to Hubbard. While working for the agency, Nozette carried a security clearance that allowed him access to “critical nuclear weapon design information”.